The wide receiver position has slowed down after a hot start to the fantasy football season. Will it improve? I have my doubts. Teams are throwing the ball more than ever, but they’ve adopted much of what the college game has done, by spreading around the ball to multiple different positions. It heightens the value of the running back position since running backs don’t just run the football anymore. But it has dwindled the value of top-flight wide receivers, with defenses focusing on stopping them, and offenses becoming more accustomed to sharing the wealth. That will likely continue into this week, so here’s the week 9 fantasy football start ’em, sit ’em guide for wide receivers. Without Golden Tate, someone is going to have to be targeted for the Lions offense. With Xavier Rhodes likely to return, I’m fading Marvin Jones, who I believe will have to match-up against Rhodes. So instead of Jones, I’ll follow Golladay this week as a potential WR1. The Vikings are getting healthier in the secondary, but the Lions have a high-octane passing game that will be a high-volume unite. Golladay has seen his target share almost disappear in recent weeks, but without Tate in the lineup, Golladay should have an opportunity to put up solid numbers against the Vikings. Tampa Bay’s pass defense is terrible. We’re at a point where pretty much anyone on the opposing team should at least get a look. Moore tallied six targets, hauling in five catches for 90 yards in week 8 against Baltimore. The most important part of that game is that Cam Newton is showing more trust in the rookie wide receiver. And that trust should earn him more opportunities at production in week 9. Tampa Bay is allowing the fourth-most fantasy points per game to wide receivers in the last four games. They’re also allowing the second-most yards per pass attempt in the NFL. This is a plus-matchup for an emerging wide receiver. I’m not willing to give up just yet on Baldwin. He hasn’t been good this season after battling back from injury. He netted just two catches on three targets in week 8 in a game where the Seahawks moved the ball consistently. 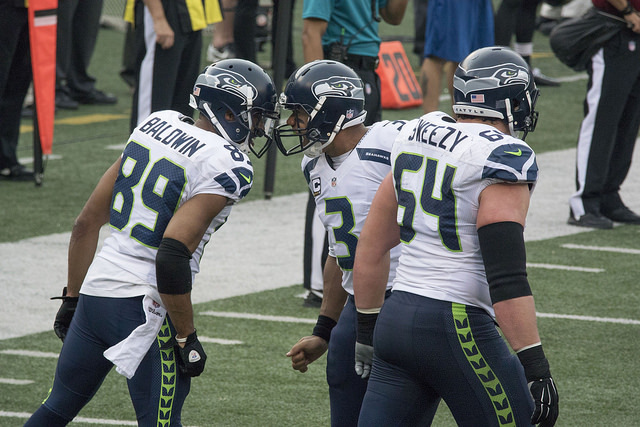 Seattle is showing a better run game this season, reducing the amount of targets Baldwin earns. However, he’s still the most trusted weapon for Russell Wilson and garnered eight targets just two games ago. The Chargers have a good secondary, but Baldwin should be targeted enough to have opportunities at production. I’m pretty much forced to start Davis in week 9 on my fantasy football team. If I had another choice, I’d take it. I’m firmly in the bye-week blues this week, so Davis, with his measly 83 combined yards in the last three games, will have to get a start. Tennessee’s passing offense cannot be trusted. Marcus Mariota is not the quarterback everyone expected he would be years ago. And Davis has been a bust this season after getting some early season accolades for being a possible surprise fantasy football option this season. The Cowboys are allowing the second-fewest fantasy points per game to wide receivers, so if possible, Davis should be sat. Nelson just doesn’t get enough targets to be a viable fantasy football threat. Even with Amari Cooper out of Oakland, I still don’t trust Nelson enough with his volume to anticipate solid production. He caught only one of four targets in week 8 against an average Indianapolis secondary. He has just 11 targets combined in the last three games. San Francisco is not a great team against the pass, but the Raiders still have other weapons that Nelson doesn’t have to get involved for Derek Carr to move the ball down the field. Williams has been a major contributor for fantasy football rosters in recent weeks, with more than 100 yards receiving in each of the last two games. The major problem with those numbers is that those aren’t sustainable. He’s a low-volume wide receiver, and even with the big production in the last two games, he still only commanded eight combined targets. That’s a problem against a defense that can still defend against the pass. Seattle is still an above-average pass defense that will do a solid job at defending against the big play, something Williams has to have to be viable.